Pom Pom Island, there is only one word to describe it....paradise. I arrived here on Pom Pom on the 18th of April 2012 and literally felt like I had stepped into paradise. The view of the island from the boat was just breathtaking, turquoise water, white sands. I was overwhelmed with excitement at the fact that I was going to stay in this beautiful place for my masters project! As I got off the boat I was greeted so nicely by all the staff and instantly felt at home. Something told me this was going to be a good three months. My time here will be devoted to conducting fieldwork for my Msc project with Professor Steve Oakley as my mentor, on the soft coral Parerythropodium fulvum fulvum. Yes, I know it is a mouthful hence Steve named it ‘the yellow triffid’ due to its fast growth rate and ability to grow over a lot of coral and substrate. I will be looking specifically at this growth rate and how it is affected by depth, current and location which is something that has not been looked at before with regards to this species thus will be answering numerous ecological and biological questions with regards to this species. After growing the yellow triffid in the coral nursery at depths of 3-5m (we went to Pandanan Island to collect a surplus of yellow triffid and then placed fragments of it on 15×15cm concrete blocks and letting it grow for two weeks) we plan to go to 6 different locations (regional island reefs varying by current intensity and ecology) and place the coral at varying depths of 5,10,15,20,25 m along a transect and recording the growth rate at 2 week intervals. This will be done by photographing each block of yellow triffid and working out the increase in horizontal growth using a design software programme called AutoCAD. This is easily feasible due to the fast growth rates observed by this species. If I have time I will try and also look at what might be predating on the yellow triffid as it has been observed that colonies of yellow triffid in the wild only increase upto a certain size. Thus something very obsecure and not obvious has to be predating on it, as it has yet to be seen. I would also like to look at competition of yellow triffid with numerous aggressive hard corals as I have observed it growing over only some species of hard coral in the wild and it has not been able to grow over other species. 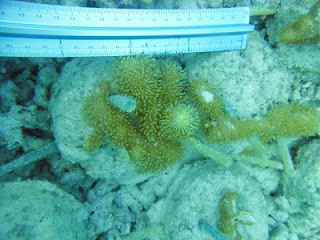 Determination of these specific species would increase knowledge of this species of soft coral has not been studied in great depth.